Savvy shoppers’ most valuable tool this holiday season will be their smartphone, as many will leverage their handy devices to look up product information or find nearby stores while on the go. In fact, a new report from mobile marketing company Vibes reveals that 86 percent of consumers plan to use their phones this holiday season. Out of those consumers, 53 percent will leverage their mobile devices to look up product information to help with their purchasing decisions, while 48 percent will use their devices to find specific store information, such as location and hours. Proving that at the very least, retailers should ensure that their brick-and-mortar locations are easily discoverable on the mobile Web. 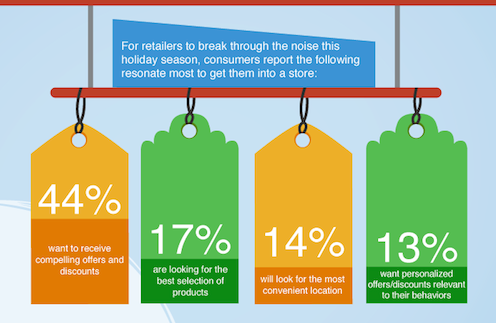 In order to reach holiday shoppers on mobile devices, merchants must first know what consumers want. According to the study, 44 percent of consumers are looking for offers and discounts, 17 percent are looking for the best selection of products, 14 percent are searching for the most convenient location and 13 percent want personalized offers that are relevant to their behaviors. Other findings from the study show that 32 percent of consumers plan to actually make purchases on mobile websites, confirming that an omnichannel strategy is now more important than ever for retailers. Moreover, consumers that admit to showrooming often during their shopping experiences are three times more likely to want a personalized experience from in-store personal and are four times more likely to respond positively to an engaging mobile experience.